We have high quality Gold Coast and Brisbane light towers available for hire for all types of civil, building and construction applications. Our solar light towers (SLT) are Australian designed and engineered and as these are 100% solar powered have no ongoing running costs. The SLT is self-sufficient and will operate night after night without noise or regular maintenance. 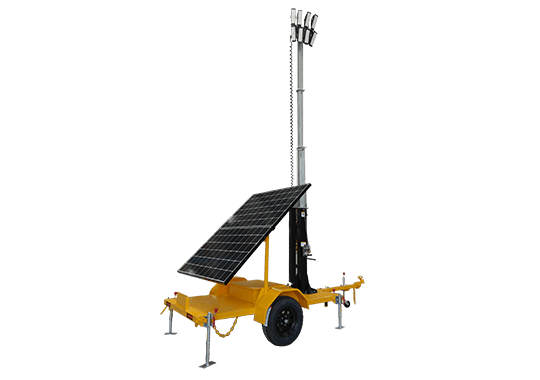 Our solar light towers will efficiently illuminate your work site, warehouse or factory. The fully automated and trailer mounted light towers have masts up to 6 metres high, which can light a surrounding area of 30 metres. Perfect for outdoor events, construction sites and illuminating any dark areas onsite, the solar light towers are ideal for providing security at night. Simple and easy to transport and set up, solar lighting towers can be set to run automatically and will turn on by dusk and off by dawn without any human intervention required. The Terra Light ® diesel lighting tower offers 4000W of low glare lighting on a 9m telescopic mast. A sturdy transportable trailer supports the Kubota diesel engine and 7KVA Linz generator. The Terra Light® is suited to open spaces requiring effective lighting, such as roadwork, car parks, mine sites, events & festivals. A Terra Light® will cast the equivalent of daylight up to a 50 meter diameter. As a result, just 3 x diesel lighting towers can light up an entire football field! Contact us today for all your traffic management hire needs!